Despite its somewhat humble beginnings, MIDI has revolutionised the way we compose, re cord and perform music. It is, however, a technology that is somewhat easier to capitalise upon if you happen to play keyboards. For those whose primary instrument skills lie elsewhere, generating MIDI note performances from your (non-keyboard) instrument of choice can still be a frustrating experience. This has been particularly true for guitar players and, while things have undoubtedly improved, we are still waiting for the MIDI guitar Holy Grail: the option to generate MIDI note data by playing your normal guitar without any technique compromises. Therefore, when a sample library company as highly regarded as EastWest teams up with a guitar pickup company (including MIDI pickups) as innovative as Fishman to launch a new series of virtual instruments aimed specifically at guitar players, lots of folks are likely to sit up and take notice. So just where does EastWest’s new MIDI Guitar Instrument Series take us on our search for MIDI guitar nirvana? The various attempts to integrate MIDI technology and guitar technology have made for an interesting if often anti-climactic journey. There have been some success stories, most notably when the aim is either a dedicated guitar synth (such as Roland’s various GR series devices) or a dedicated controller that is ‘guitar-like’ but not really a guitar (Starr Labs’ Ztar, for example). However, what most guitar players with an interest in MIDI really want is the option to play their standard guitar and generate MIDI note data. On this front, hexaphonic pickups — where the pickup technology detects the vibration of each string individually, allowing its pitch to be calculated and then converted into MIDI note data — have proved to be the most popular technological solution. In modern systems the tracking is generally very accurate and responsive, but playing technique has to be pretty clean. It is also better suited to single-note melodic lines or chord arpeggios; ‘strumming’ is a bit of a no-no with lots of spurious MIDI note data being generated. As a player I’ve found that while this is still very useful technology, it is one with obvious compromises. Even once you adapt your playing technique to the needs of your MIDI pickup system, perhaps a further limitation is the design of the majority of software-based virtual instruments themselves. Hexaphonic pickups allow each string to transmit its MIDI data on a different MIDI channel. Unlike with a pitch-bend wheel on a keyboard, this then allows you to bend one string while the pitch of the others (transmitted on different MIDI channels) remains constant. However, most virtual instruments — synthesis- or sample-based — are not really designed to handle this multi-channel MIDI input. Aside from just avoiding string bends, a common workaround is to configure six instances for each virtual instrument sound, each set to respond to a different MIDI channel (guitar string). Doing this manually for every sound you might wish to use is clearly a right royal pain in the posterior. An inexpensive off-the-shelf solution such as Even Harmonic’s Gtak (now in v.5 but v.3 was reviewed by Paul White in the July 2009 issue) provides a shortcut to this process but is only configured for the sounds bundled with NI Kontakt; outside that, you are on your own. The Fishman TriplePlay wireless MIDI guitar system.This is a problem still waiting for a better solution, and EastWest’s MIDI Guitar Instrument Series is attempting to provide just that. The system consists of two components. 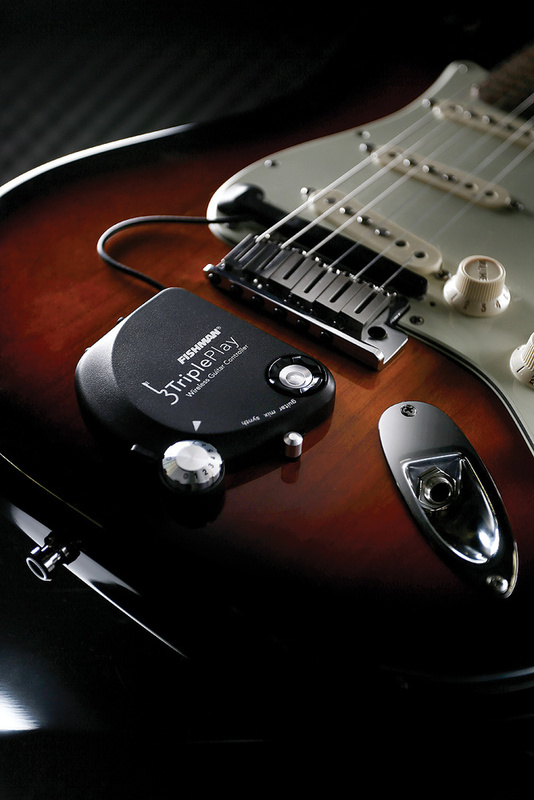 The first of these is provided by Fishman’s TriplePlay MIDI pickup system (see Paul White’s review in SOS August 2014 issue). The TriplePlay is both an elegant solution (it offers wireless connectivity to your DAW/sequencer via a USB dongle) and offers tracking that is both accurate and fast. The bundled software provides configuration options for the pickup and, whether used stand-alone, or as a plug-in within your DAW, acts as a host for other third-party virtual instruments. It also adopts the relatively new MIDI Polyphonic Expression (MPE) protocol, which allocates each MIDI note its own MIDI channel enabling per-note MIDI expression data (including pitch-bend), to be transmitted. It’s also considerably friendlier to your computer’s CPU. The second component within the system under review here takes the form of the five individual Play libraries within the MIDI Guitar Instrument Series: Orchestra, Ethnic, Soundscapes, Guitar & Bass and Keys & Perc. Many of the individual sounds are drawn from the impressive array of sample-based instruments found in EastWest’s standard libraries. However, they are specifically configured with MIDI guitar in mind so that the sample engine will work with the six MIDI channel format available from a MIDI guitar pickup. For the purposes of this review, I was supplied with a Fishman TriplePlay pickup (plus associated software) and the five MIDI Guitar Instrument Series volumes. Installation of both hardware and software was straightforward. I received the libraries on a USB drive but, if purchasing via download, do be aware that these five titles together total over 100GB. Whether used stand-alone or as a plug-in within a DAW/sequencer host, the TriplePlay software provides a good range of configuration options. Again, Paul covered these in his 2014 review, but a few points are worth emphasising here. First, there are two ways to load patches into the TriplePlay software. 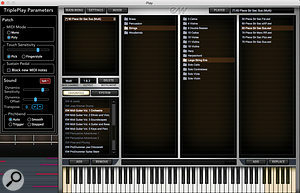 The MIDI Guitar Instrument Series documentation suggests that these libraries should be loaded directly from the TriplePlay software’s own browser. This follows a pretty conventional layout and is easy to use but, most importantly, this route ensures all of the specific programming within the patches designed to exploit the TriplePlay is preserved. It’s also much friendlier to your computer’s CPU. For other (non-MIDI) Guitar Instrument Series EastWest/Play compatible libraries that you happen to own, you can use the standard Play browser function once Play is hosted within the TriplePlay front-end. The second point is the four modes for handling pitch-bend. Auto makes for a good starting point as it ignores minor pitch changes but will respond if the pitch-bend seems more deliberate. Trigger mode avoids pitch-bend until any bend reaches a new note pitch, at which point a new note is triggered. 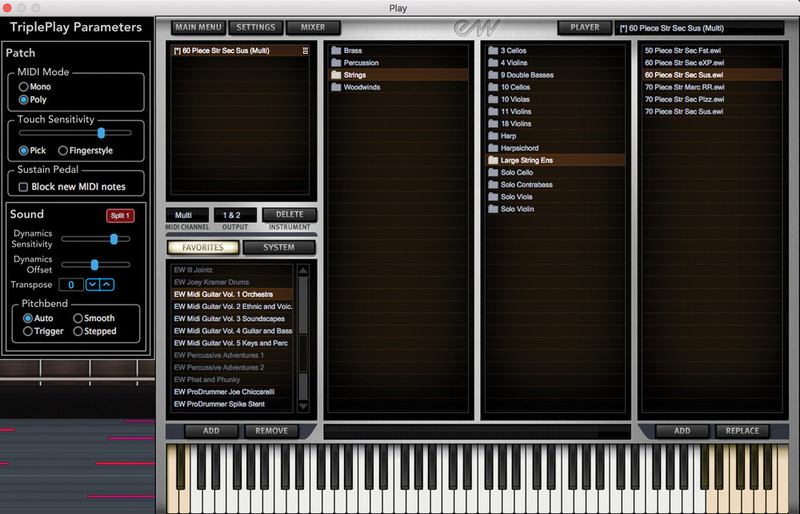 This mode is perhaps most suited to keyboard-based virtual instruments. Smooth mode is similar to Auto mode but follows your pitch-bend as closely as possible without any pitch-correction or filtering of minor pitch changes. Finally, Stepped mode is similar to Trigger mode in that notes are rounded off to the nearest semitone but, when you pitch-bend to the pitch of a new note, you don’t hear the attack phase of the new note (more of a legato style?). 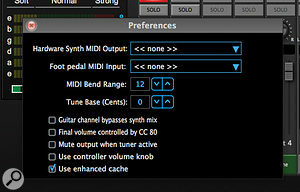 All these modes can be useful and some suit different virtual instrument sounds better than others. The third point worth noting is that you can set the pitch-bend range of the TriplePlay system within the Options/Preferences panel. The default value is 12 semitones and, as all of the preset patches within the MIDI Guitar Series libraries are pre-configured to match this, no adjustment should be needed. The same will most likely not be true if you use the TriplePlay pickup with other virtual instruments where the default setting is more likely to be two semitones. Finally, it is most certainly worth experimenting with the MIDI velocity mapping curve in the instrument settings pane. I found it easier to get a ‘cleaner’ performance with a convex curve rather than a concave one. I suspect this is simply because it meant I didn’t have to pick the guitar strings quite so hard to generate intermediate MIDI velocities (instrument volumes), which resulted in fewer spurious MIDI notes being generated. Fishman’s TriplePlay software provides configuration options for the pickup, the ability to host multiple virtual instrument plug-ins and, for the MIDI Guitar Instrument Series, a dedicated browser for preset loading. So much for the hardware, what about the sound libraries themselves? Vol 1 — Orchestra — provides some 190 individual instrument presets across the four main orchestral sound sections; strings, brass, woodwinds and percussion. There is about 18GB of sample data in total. As with all of these libraries, samples are presented at 16-bit/44.1kHz resolution. The Strings category includes a number of large string ensemble patches covering a variety of articulations that would suit both fast passages or slower, sustained legato playing and, of course, a rather nice pizzicato patch. You also get various smaller ‘sections’ featuring different numbers of violins, violas, basses and cellos as well as solo instrument patches for violin, viola, cello and contrabass featuring the most common articulations. The latter are perhaps not the strongest part of the library (they do have a certain earthy, quite raw, sound to them) but the various sections are very usable. With the Brass category, you don’t get the large ensemble patches but, instead, both small sections and solo instruments for trumpets, trombones, French horns and tubas. You can, of course, layer these sounds either within your DAW/sequencer on multiple tracks or via the Play front-end’s ability to stack multiple presets into a single patch. I did find one or two of the release layers in the various brass instruments to be a bit ‘breathy’ for my taste but, again, Play lets you dial these in/out to suit your own requirements. I did, however, particularly like the trombones and tuba patches. These had a nice growl at lower pitches — very epic! As shown here for the Orchestra title, each of the five MIDI Guitar Instrument volumes provides a broad selection of instrument presets.Woodwind follows a similar pattern to Brass but with more solo instrument options and fewer small sections. You get groups of three clarinets, flutes and oboes plus solo flute, alto flute, piccolo flute, bassoon, contrabassoon, oboe and two alternative solo English horns. Each is supplied with a number of articulations although, as you might expect, somewhat fewer than for the strings and brass. Some of the solo instruments here, for example the solo flute and English horn, were really rather nice, especially when used for slower passages. The Percussion category is sub-divided into wood, metal, drums and cymbal/gong sub-categories. This is perhaps the thinnest section of the library overall but there is a nice church organ, vibraphone and gong. Personally, I could have done with a few more actual drum options but, as there is the separate Keyboards and Percussion library within the series, maybe that’s not so surprising? Overall, this is a pretty solid orchestral selection. OK, so the breadth of instruments perhaps would not compete with a top-end dedicated orchestral library (for example, EastWest’s own Hollywood Orchestra), and you don’t get all the subtle articulation options such a library might offer, but as a broad instrument palette for mocking up your latest orchestral score, this volume covers a lot of ground. My only other observation would be that you don’t get the level of ambience control that more up-market libraries offer. While the Play interface does include a very nice reverb, the majority of the instruments presented here have been recorded with some room ambience. On the whole this is very tastefully done, and for some patches, the release samples can be dialled back to reduce the included ambience somewhat, but you don’t get multi-mic blending features to control ambience. The upside of this is that, individually, most of the patches are pretty resource-light so, providing your computer is of a reasonable specification, you could build some pretty big instrument combinations without too much of a strain. Vol 2 is Ethnic & Voices. Here we get 120 patches built from 17GB of sample data, with many patches reworked for the MIDI guitar format from libraries such as Ra, Voices Of Passion and Goliath. The presets are divided into four categories: bowed, plucked, voices and wind. While I think the Orchestra title makes for a fairly coherent whole, Ethnic and Voices is, perhaps inevitably, a bit more of an ‘edited highlights’ collection. What’s here is generally very usable but the wider world includes a considerable number of ‘ethnic’ instruments and I’m sure EastWest would not see this as a comprehensive collection. The Fishman software can itself be run as a plug-in within your usual DAW/sequencer host, as shown here within Cubase Pro 9.So what are the highlights of these edited highlights? Well, there is a rather nice 30-piece string section with three different articulations, and that provides an alternative to the string sections in Vol 1 as does the solo MidEast Fiddle instrument. I had fun with the small number of sitar patches and the Irish low whistle has a nice breathy character. Elsewhere, there was a scattering of some of the usual ethnic instrument suspects including kotos, mandolins, santoors, bag pipes, duduk, pan flute and shakukachi. However, for me at least, the most interesting part of this volume was amongst the voices. OK, so you are getting the usual male and female choir sounds with various ‘oohs’ and ‘aahs’, but they are most certainly very usable and there are options for patches with and without vibrato plus different amounts of ambience. There are also some ‘effected’ patches that almost have a synth-like quality, patches with Indian and Syrian phrases (very characterful but obviously limited to the included phrases) and Welsh and Boys Chorus presets. Perhaps the best of the bunch were the two Full Chorus patches. These were very nicely balanced and, for a generic — but very satisfying — choral sound, did a good job. Adjusting the attack control for the volume envelope allows you to quickly customise these patches for either faster or slower passages. Soundscapes makes up Vol 3 with 11GB of samples and 72 patches. This is pretty much what you might expect, with patch names such as Freak Shimmer, Weird Celesta, UFO Choir, Bird Of Peace or Colossus Pad. There were plenty of options to have some fun with here, in a creepy soundscape sort of a fashion, and I particularly liked the various Ebow guitar patches, the Dhali Pad and the Colossus Pad (which was, well... colossal). 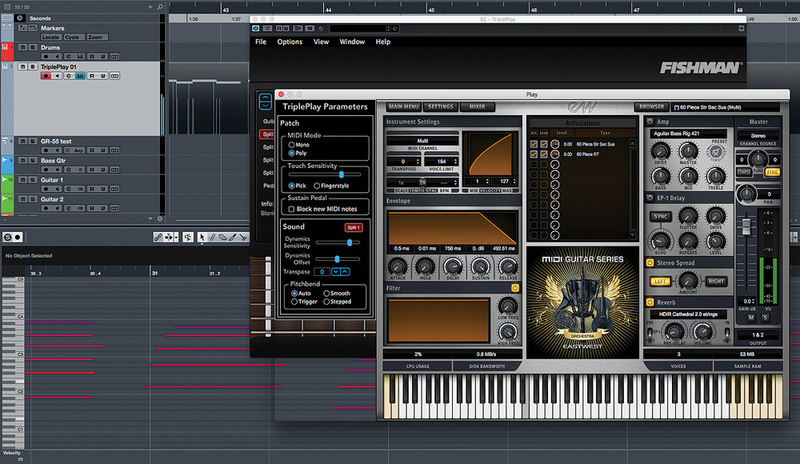 There was also some fun to be had by stacking the presets within Play to create hybrid sounds. All the MIDI Guitar Instrument Series patches are pre-configured to work with the Fishman’s default 12-semitone pitch-bend range.That said, soundscapes tend to be texture sounds and complex chords or rapid playing are generally not required. There are, perhaps, fewer benefits to having these sorts of sounds specifically configured for MIDI guitar triggering, and even a ‘standard’ soundscape-style library will work pretty well with a MIDI guitar controller for some slow, single-note, passages. Equally, some folks might turn to a synth for their soundscape and pad needs. It might seem a bit counter-intuitive for a guitar Player to want to use a MIDI guitar controller to play sample-based virtual guitar and bass sounds. However, I think Vol 4 — Guitar & Bass — offers more than enough to make some sense of the concept. This library is built upon 38GB of samples and provides over 90 presets split into guitar and bass categories. A range of acoustic and electric guitars are represented in the guitar category while the bass category is more closely focused on electric models. In both cases, we get some ‘clean’ and some with effects, including overdriven or high-gain sounds. Some of the overdrive sounds were sampled from a real overdriven amp while other patches make use of Play’s built-in amp modelling, which, incidentally, does a pretty good job. There were a number of highlights for me amongst this selection. On the whole, I preferred the cleaner guitars (adding my own effects as required) but you have a selection of presets based upon more conventional instruments such as Les Paul, Telecaster and Jaguar models. However, there are also some more esoteric instruments based upon sampled baritone and seven-strings. What I found particularly usable were the various acoustic guitars and, for arpeggiated chords or melodic lines, the instruments based upon nylon- and steel-strung guitars were very good. Don’t get too ambitious with the strumming though: even with a couple of presets with ‘strum’ in the title, strumming is not really something MIDI guitar systems handle with much grace. The ability to do single-string pitch-bends is most welcome though and works very well when used with a little care. Perhaps less successful are rapid hammer-on/off techniques; you need to execute these very cleanly to avoid the possibility of a few spurious MIDI notes or undesirable pitch data being generated. Amongst the basses there were also some very good performers. For example, I particularly liked the fretless Fender Jazz bass. This had a wonderfully deep, smooth sound and seemed to respond really well when notes were just gently bent; I could easily imagine pulling this patch out when I needed a fretless sound. I also liked a good number of the presets based upon a Spector bass that offered very even performances with a solid bottom end. In short, there are plenty of sounds here that would make very convenient replacements for a real bass if recording the genuine article was not an option. Oh, and the cleaner patches respond very well to the bass amps within Play’s amp-modelling options. Vol 5 is Keyboards & Percussion. 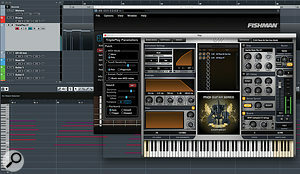 Between them, the two categories contain 93 presets constructed from 23GB of samples. While you can choose to string bend some piano sounds if you wish, the keyboard presets are perhaps more accurately served by the TriplePlay’s Stepped or Trigger modes. The presets themselves cover some fairly obvious (and sensible) choices with various organs, harpsichords, a selection of both acoustic and electric pianos, Rhodes, vibraphone, glockenspiel and xylophone, and a few more quirky options thrown in for good measure. The Steinway B piano preset is perhaps served with slightly too much added reverb for my taste, but if you roll that off within the Play effects there’s a very solid and usable piano underneath. 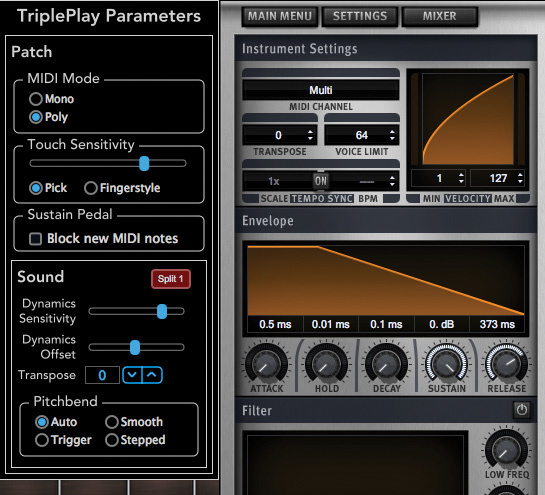 This responds very well to the TriplePlay’s MIDI output and, despite guitar chord voicings not really being appropriate for realistic piano performances, this is perhaps one area where the whole MIDI guitar approach brings its rewards; given my limited keyboard skills, I can create much more believable piano parts with the TriplePlay and this patch than I ever could via a conventional MIDI keyboard. There are a smaller number of patches within the Percussion section, but it does include a very usable standard acoustic kit and an impressive toms ensemble. The latter has some great dynamics and the responsive triggering that TriplePlay offers does come to the fore here. Indeed, this section provided one of the more surprising elements of the whole series of libraries for me: triggering drums via a guitar can actually be an intuitive and musical process. 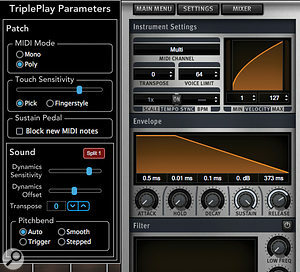 So is the TriplePlay and MIDI Guitar Instrument Series the Holy Grail that guitar players have been waiting for? It’s certainly an impressive combination and, given the performance of the TriplePlay pickup and the convenience offered by the MIDI-guitar-specific design of the various patches across the five volumes, I think the package as a whole is a step forward. Configuring the pitch-bend mode for the pickup and the MIDI velocity mapping curve can make a huge difference to just how easy the system is to play and, importantly, obtain ‘clean’ MIDI note data from.While I did the vast majority of my testing using the supplied TriplePlay pickup, I did also get my Roland GK-3 (using MIDI output from a GR-55) to work with the MIDI Guitar Series libraries and, although you obviously don’t have quite so many configuration options as provided by the TriplePlay, it worked pretty well. That said, if I was to choose one of the pickups solely for the purposes of getting MIDI note data into a sequencer, I’d take the TriplePlay; the dongle-based wireless connection is super-convenient in that context but I’d also give it the slightest of edges in terms of responsive and reliable generation of raw MIDI data. In use within Cubase Pro 9, the MIDI performances I was able to generate were undoubtedly the cleanest I’d obtained with any pickup-based MIDI guitar system. So who might be tempted by this combination of pickup and purpose-built libraries? Well, guitar players with limited keyboard skills are perhaps a given but, in terms of the libraries themselves, EastWest have covered a lot of ground across all five volumes. That’s understandable and the broad palette of sounds would make for a very flexible ‘start-up kit’ for any guitar-playing musician who is serious about building their first heavyweight collection of sample-based sounds. In the main, the sounds are very good indeed but some are perhaps better than others in terms of how well they work — and how much they capitalise upon — the integration with the TriplePlay system. In use, for me at least, the Orchestra, Guitar & Bass and Keyboards & Percussion volumes had the most to offer. I’m less convinced that, for pad/soundscape-style sounds, for example, you need a library that’s specifically designed for MIDI guitar triggering. Slow attacks and sustained notes demand less from your MIDI guitar system in the first place and there are some impressive alternatives out there even if not specifically configured for MIDI guitar input. For guitar players who already have a decent virtual instrument collection (despite the limitations of their keyboard skills), perhaps there would be more of a dilemma. You might already feel that you have sample libraries that cover the sonic ground contained within specific MIDI Guitar Series volumes (indeed, some of those might be the same EastWest sounds from their standard libraries). The TriplePlay is the best hexaphonic pickup system I’ve so far experienced for working with my desktop DAW/sequencer and it can be made to work with all those existing ‘standard’ libraries I already own, albeit without quite the integration offered by these MIDI Guitar Series libraries. 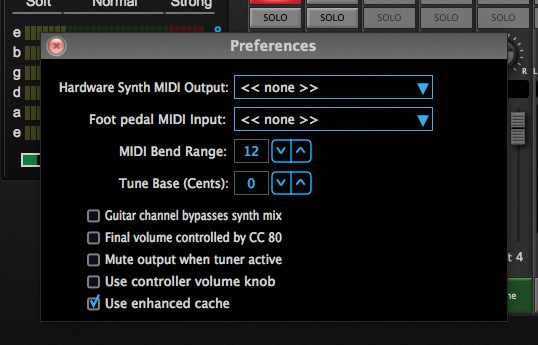 Having sought the ‘perfect’ MIDI guitar system myself over rather too many years, and experienced rather too many disappointments, it’s great to see one of the bigger sample library developers taking the needs of MIDI guitar players seriously. The five volumes of the EastWest MIDI Guitar Series integrate well with the impressive Fishman TriplePlay pickup and, for guitar players prepared to invest in a practical solution, albeit still with some performance compromises, this combination is undoubtedly worth exploring. There are a number of obvious alternatives for musicians looking to use their guitar skills for creating MIDI-based performances. For example, Roland’s GK-3 pickup and GR-55 hardware are very impressive when used together but, for generating MIDI note data to trigger virtual instruments, I’d say the TriplePlay has a slight edge. There are other approaches that have potential. 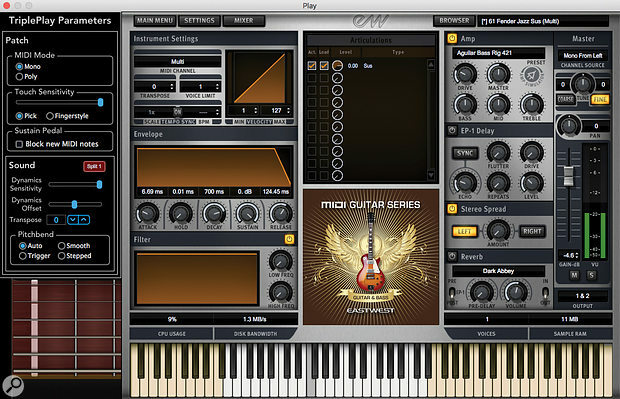 For example, at opposite ends of the price spectrum, software-based pitch-to-MIDI conversion such as Jam Origin’s MIDI Guitar 2 (which uses algorithms not unlike real-time pitch-correction plug-ins but attempts to offer polyphonic detection/MIDI conversion) or Keith McMillen’s StringPort 2 guitars (with all sorts of sensor technology built into what looks like a standard guitar neck) might move things forward. However, right here, right now, the EastWest/Fishman combination is about as tightly integrated as a MIDI guitar controller and virtual instrument package currently gets. Tight integration between MIDI Guitar Series libraries and the TriplePlay system. Broad palette of sounds available across the five volumes. Technical performance is very good. Even the excellent Fishman pickup still requires some adaptation of playing technique. May replicate sounds you already own. The hardware and software combination requires quite a financial commitment. We might still be waiting for the perfect MIDI guitar system but the combination of the various MIDI Guitar Series libraries and the Fishman TriplePlay pickup is impressive. It does, however, require a fairly substantial financial commitment. EastWest MIDI Guitar Instrument Series $159 each or via Composer Cloud subscription ($29.99 per month). TriplePlay Wireless MIDI Controller $399.95. EastWest MIDI Guitar Instrument Series $159 each or via Composer Cloud subscription ($29.99 per month), TriplePlay Wireless MIDI Controller $399.95. 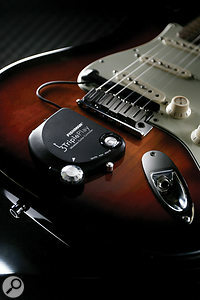 Fishman TriplePlay wireless MIDI pickup.